Need to getaway for the long weekend? Travel by train on the Amtrak Pacific Surfliner to top destinations including San Diego, Orange County, Los Angeles, Ventura, Santa Barbara and San Luis Obispo. Check out our picks for Southern California attractions including outdoor adventures, picturesque beach towns, and special events. Enjoy beautiful ocean views from the train and step off at one of the coastal cities along the Pacific Surfliner route. Sandy beaches are just a short walk away from the stations in Oceanside, San Clemente, Ventura, Carpinteria and Santa Barbara. Bring a picnic, stroll along the promenade, watch surfers or join a whale watching excursion! Experience the excitement at the Del Mar Race Track before the summer season comes to an end. Ride to Solana Beach Wednesday through Sunday and on Labor Day (Sept. 3), and catch the free shuttle to the track. On weekends, there are activities for kids, concerts, and other special events. Connect with nature by visiting Channel Islands National Park, a chain of islands off the coast that offers plenty of opportunities to hike, kayak, birdwatch, and more. This day trip is the perfect addition to a weekend in Ventura. Start by taking the free trolley over to the harbor, then join an Island Packers cruise to one of five stunning islands. Located just south of the Grover Beach Station, the Oceano Dunes is a very popular place to rent a dune buggy and cruise on the sand. It can get very busy on holidays, so book your rental early and follow the rules and regulations for your safety and others. The Pacific Surfliner trains can become busy during the summer, especially over holiday weekends. Plan ahead to avoid the crowds and make the most of your Pacific Surfliner trip with these Tips for Summer Train Travel, including information on upgrading to Business Class, receiving train status alerts, and what to do with your ticket if your travel plans change. Due to holiday travel demand, the Rail 2 Rail Program will be partially suspended from Friday, August 31 through Tuesday, September 4, 2018. During this time, COASTER and Metrolink Rail 2 Rail passes will not be accepted on Pacific Surfliner trains. The program will resume on Wednesday, September 5, 2018. The Rail2Rail Program was started to complement Metrolink and COASTER schedule options using Pacific Surfliner trains that had additional capacity. This blackout ensures that there is sufficient capacity available on the most popular trains for our Amtrak ticketed riders while maintaining the greatest number of transit options possible for those traveling over the holiday weekend. Rail 2 Rail riders can view Metrolink schedules here and COASTER schedules here. To purchase an Amtrak ticket, visit pacificsurfliner.com. There is a lot to look forward to in the coming months. September is Rail Safety Month, the California Avocado Festival is coming to Carpinteria in October, the Del Mar Race Track will re-open for the fall season, and more. Subscribe to our blog or follow us on social media for updates. 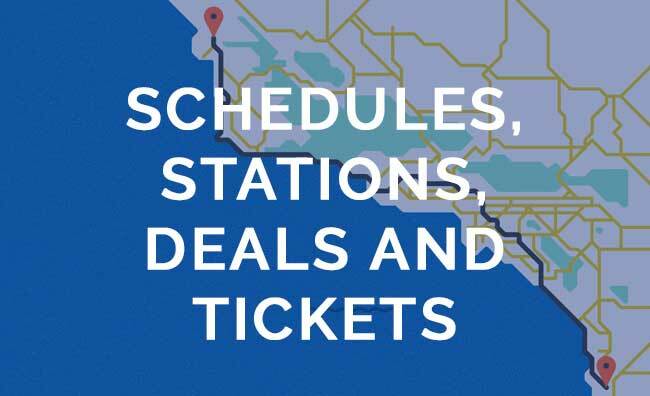 You can also visit pacificsurfliner.com/promotions for the latest deals and events.